Tiling has become an important tool for us. Our area of land has some of the best farm ground in the world, but it is also very flat. Investing in our own tiling equipment has shown numerous returns, as well-drained soils result in higher yielding crops. 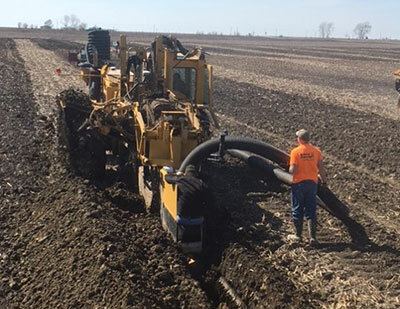 Weather permitting, we install field drainage tile after harvest is complete, and occasionally finish up projects in early spring. A typical tiling project uses 4-inch corrugated plastic tile spaced every 50-100 feet throughout the field, depending on drainage needs. Irrigation is also a recent improvement for a few of our farms. By choosing to drill wells and erect irrigation systems, we can assist Mother Nature when she fails to deliver much needed rain. We also use our irrigation systems to fertigate our fields. By applying liquid fertilizer, mixed with water, through the irrigation system, we can spoon-feed the crops when they need it most. 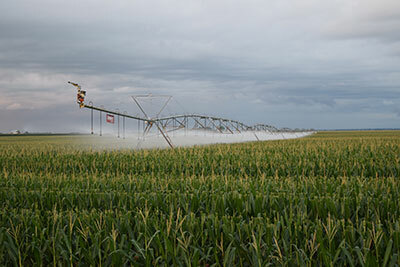 Irrigation also allows us access to value-added markets, such as seed corn production. Klein Farms participates in several custom opportunities. These include custom spraying, de-tasseling local seed corn production fields and a snow removal business. We have also recently expanded our trucking business. 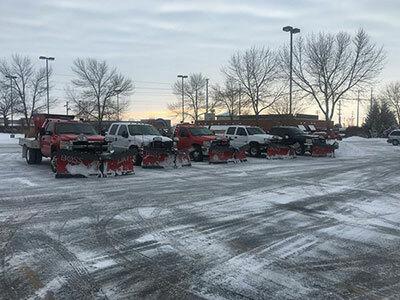 Custom work allows us to use our equipment and labor to their fullest potential, as the jobs mentioned above often take place outside of the traditional farming seasons of planting and harvesting.